Confessions of a Ribbon Addict: Dare to Get Dirty! Today, my friend and fellow Dirty Dozen alumni, Sharon Harnist, is hosting a sketch challenge and I helped out by making a card using her sketch. 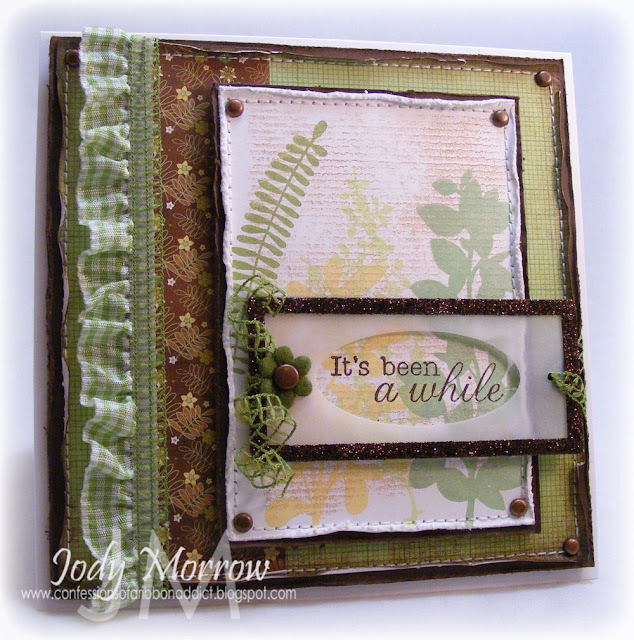 You can see a couple more cards using the sketch on Jami's blog, and of course on Sharon's blog. If you'd like to play along, you can get all the details right HERE in the forum. 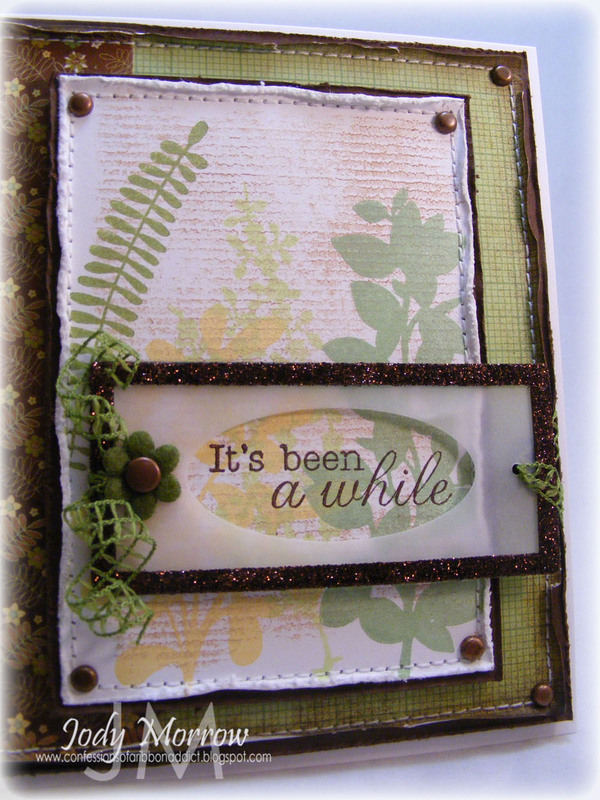 For this card, I turned to some Kim Hughes solid flower silhouette stamps. I used Versamagic chalk inks for good coverage. 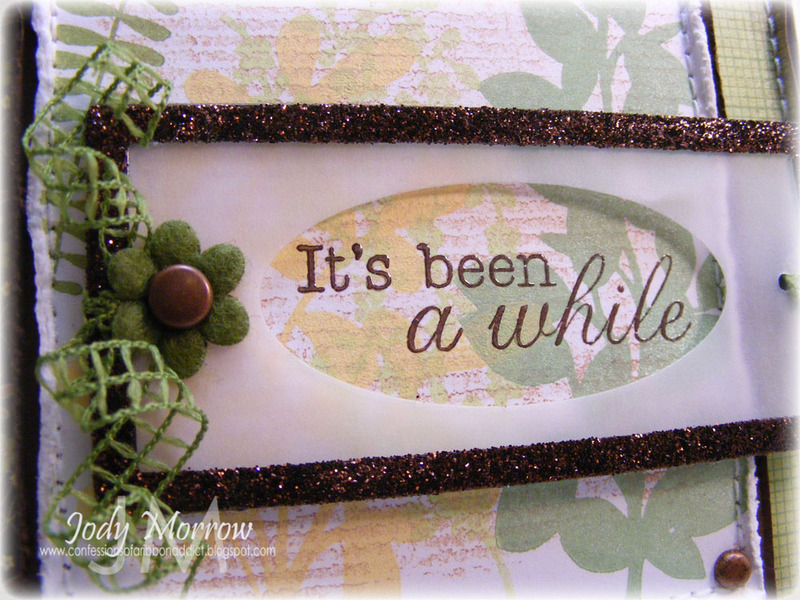 Before stamping the flowers, I lightly stamped a linen background stamp using Creamy Caramel ink. All the edges of the card stock and patterned papers were distressed using a Tonic paper distresser AND rolled with my fingers to make them nice and grungy. 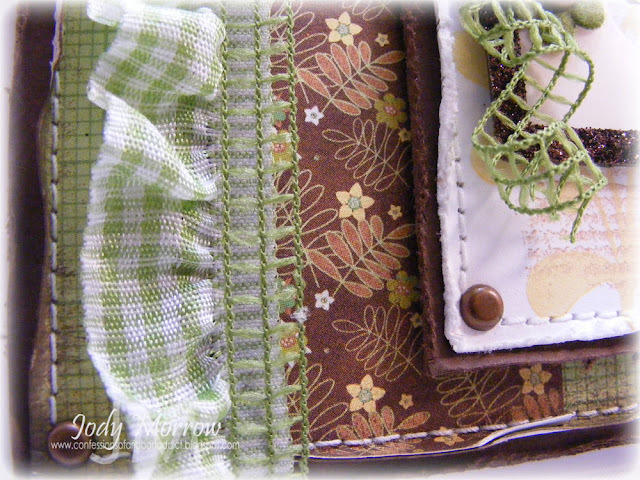 I added a fun mix of ruffled ribbon and net ribbon (and of course stitching all over). I found a metal-rimmed vellum tag in my stash, and decided to use that to create a frame for my sentiment (stamped in brown chalk ink and clear embossed). It was a green metal, which matched, BUT I wanted it to be brown, so I covered the metal rim with 1/8" red line tape and then dumped brown glitter on it. I pressed it in well, and then brushed off the excess with a stipple brush. Stray glitter drives me crazy! LOL Then, I used an oval from Spellbinders Nestabilities to cut an oval in the vellum, and strung some fun net ribbon and a felt flower through the pre-punched holes in the vellum tag. As always, a fabulous card. I marvel at how perfect your stitching always is--straight, even, perfect corners. Wow! This is fabulous! I love how the frame highlights the sentiment, and I especially love that curled net ribbon! So Perfect! I'd have to say it's probably my favorite so far. Thank you so much for sharing. oh, Jody! this is just beautiful! seriously, beautiful!